I have to make "To Do" lists or I'll get very little accomplished. Recently my daughter noticed my list on the front seat asked, "can I highlight the words on your paper?" She'd recently witnessed her Dad using a similar highlighter while working, and this was her chance to do some equally important work. "Sure!" 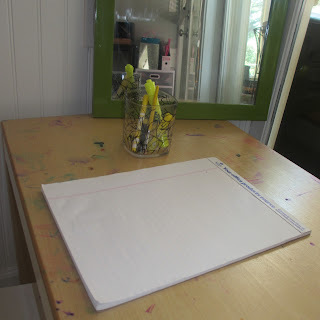 I had pictures of her highlighting work, but now I can't find them...or maybe I don't really want to showcase all the things I have to write down in order to remember to do them...surely some of you can relate! A few days later we had a GIANT yellow squash in our garden - too big to be tasty (and frankly, I was thrilled because we've eaten so much squash this summer I don't care to see another until next summer). Anyway, I wanted to find a way to include the beautiful yellow color into an invitation and remembered Addi's recent interest in highlighting. So I set up the invitation to include words for highlighting and multiple yellow writing utensils. I was curious to know how she might use the different objects. Simple invitation...forgot to include squash for picture. "Mom, I'm highlighting these words." She was initially very interested in highlighting the words. 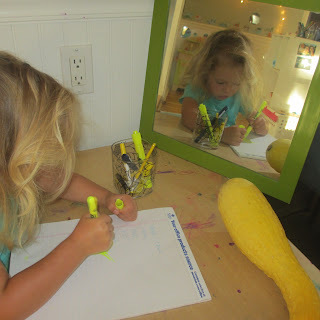 Then she became interested in using the yellow writing mediums on the squash. Finally she compared the different yellows on the squash versus the different yellows on the paper. She concluded that "squash isn't easy to highlight." Invitations are one way to research a child's interests. Sometimes the invitation is used according to our plan, other times children change it to better meet their interests, and sometimes we may consider an invitation a "flop." But they always give us insight into our child's ever-evolving mind.